It's time to decide the Drabblecast People's Choice Awards winners. Nominations are set, so now you, the listeners must vote to decide the most beloved of our 2011-2012 feature stories. Who will take home the chalice of glory this year? Links and descriptions appear below. Select Your Favorite(s) from the List of Finalists Below! A man struggles to understand his child corpse, in so doing comes to terms with his guilt. An extra-dimensional demonic entity is transformed in to a teddy bear. It kindles a tender relationship with a frightened, young girl. A life form of untold power teeters between humanity and inhumanity. A space pirate forms a unique bond with her living ship. Excellent stories, all. I must vote for the excellentest of them all, tho. 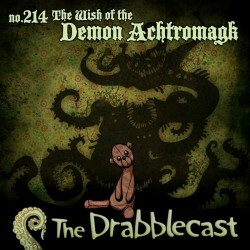 The Wish of the Demon Achtromagk. It's one of the best short stories I've ever seen. 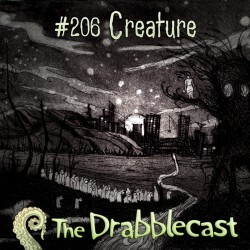 I'll admit that my emotional attachment to episode #206 threw "Creature" over the top for me. I'm glad to see I'm not alone in liking the story, though. And this isn't the MBDM voting. All of the stories should be very proud to make the cut to this final five. Looking forward to seeing who gets to take home the Sacred Chalice. I suppose it's redundant to say "gosh, this was a good year for stories on the drabblecast, wasn't it?" A flock of semaphore ravens, signaling frantically, drew me here to cast a vote for Creature. The Wish of the Demon Achtromagk for me. Episode #206 "Creature" did it for me. I lost count of how many times I have listened to it already. SteveQuest wrote: Episode #206 "Creature" did it for me. I lost count of how many times I have listened to it already. I completely agree - I liked all of these stories, especially The Demon and Followed, but Creature just had a little more magic than the rest. 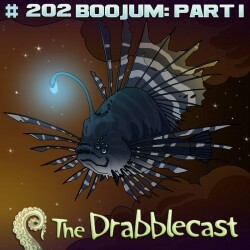 New to Drabblecast and catching up with back stories, but this is definitely one of my favorites thus far. I lost count listening to the number of times i listened to Boojum. Recently my long running Sci-fi game ran into the Mi-Go and the ship hit light drive moments before everything ended. Best Sci fi game moment personally. i am surprised it is in the lower number of votes. Creature was great but not amazing to me. Tough choice this year. I had to go back and listen to them all, and The Wish of the Demon Achtromagk came out slightly ahead. themorg wrote: I lost count listening to the number of times i listened to Boojum. Recently my long running Sci-fi game ran into the Mi-Go and the ship hit light drive moments before everything ended. Best Sci fi game moment personally. i am surprised it is in the lower number of votes. Yes, it's surprising how low Boojum is. It was one helluva story. That points out, again, what a selection we have! I think it has a tough time separating itself from Mongoose. Looking back, Boojum doesn't really break any new ground: the mixed Carrol and Lovecraft references are layered over everything, but when you strip those away what's left beneath isn't an amazing story. You could make the same argument for Mongoose, but Mongoose did it first and feels like the fresher of the two, IMO. 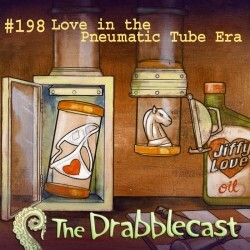 Edit: I voted for Love in the Pneumatic Tube Era. It was either that or Creature and I realized I hadn't heard the Drabblecast version of Creature (first heard it on Escape Pod). Something I like about worlds that are broken down or are in the process of breaking down.